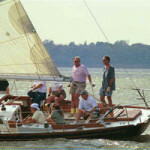 There is a reason Hinckley has the most revered name in the yachting world. 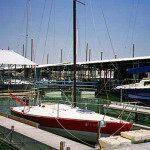 They are pure beauty, both at the dock and underway. When you see a picture of a sailboat on the cover of an elegant book, the chances are pretty good that it’s a Hinckley. 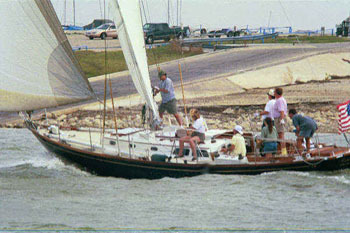 The Hinckley Company built only nine Hinckley Competition 41′s. “Southern Cross” is one of them. 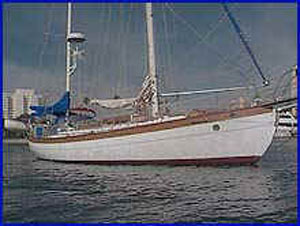 Her keel was laid in 1969 and she has been refurbished in recent years. Her fully-functional wood-burning fireplace is just one example of what sets her apart. 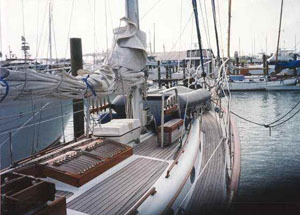 Under sail (or at the dock), she is pure grace. 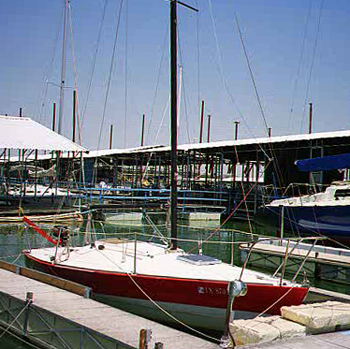 Her sleek freeboard, sweeping overhangs, and flag-blue hull will turn any head. 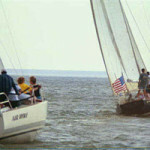 Don’t be surprised if you see other boats maneuver closer and begin taking pictures. 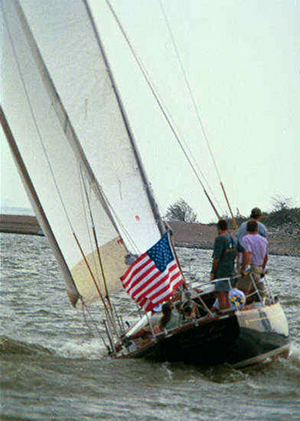 In fact, SAIL magazine specifically identifies the Hinckley Competition 41 as an example of a sailboat that has those distinguishing characteristics that make a boat beautiful (October 1998 issue). 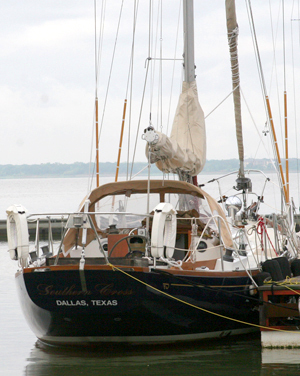 “Southern Cross” isn’t like any other sailboat in the area. In fact, she’s not even in the same ballpark with most. 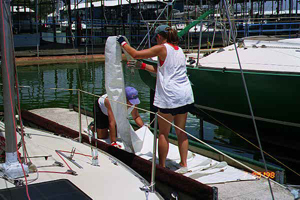 She certainly doesn’t have that “Clorox bottle” appearance common to too many sailboats these days. 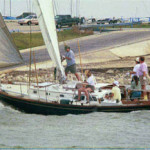 We are proud of her and are confident in claiming she is the most picturesque sailboat in North Texas, perhaps in the whole state. 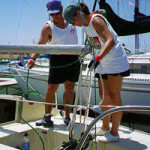 If you would like to sail onboard “Southern Cross” there are several different opportunities for you to do so. We open her to the public in our FREE Wednesday night sailing (selected evenings), Romantic Dinner & Moonlit Cruises, Open House events, Charity events, and Private/Corporate captained-charters. We recommend a group size of six to twelve. However, we have had groups of approximately 20. For pricing & more information, click here. 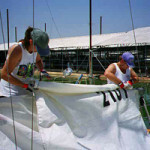 These photos are of “Southern Cross” taking part in the Long Distance (1998) race on Lake Lewisville. …by the way, we finished first! 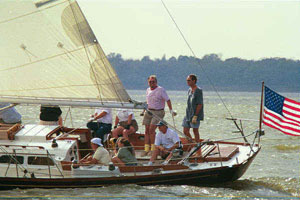 Remember, there is no excuse for an ugly sailboat! 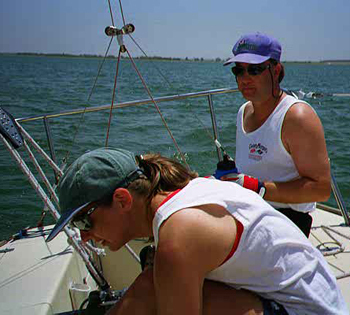 What might you expect in our Basic Keelboat course? See for yourself. These photos were taken during one of our private lessons. 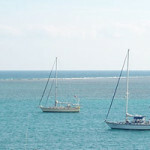 You may notice that the boats are not crowded! 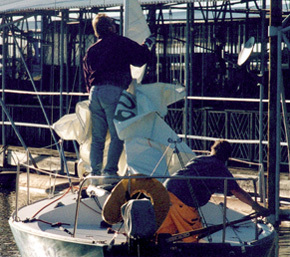 These photos show three of our J-24 sailboats: “IBA J”, “BEAR NECESSITY”, & “GREENBACK”. We are pleased to announce the addition of another J-24 “RED SHIFT” (not pictured) to our fleet. 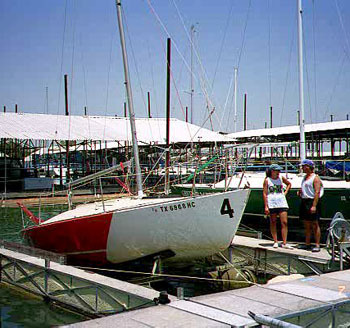 These are the boats we use in our Basic Keelboat courses. They are available for rent exclusively to our graduates! 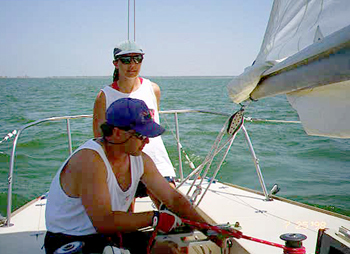 We teach you how to sail. You don’t even need a motor. After all, it’s a sailboat! 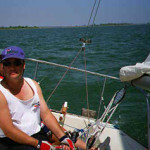 Instructor Paul demonstrates dousing a sail as he prepares to sail into a slip! Beam reaching on “IBA J” …mixed with a little relaxation! “IBA J” doesn’t even have a motor. like you’ll have to sail! “IBA J” rising out of the water on it’s hydrohoist. In the background, “GREENBACK”. 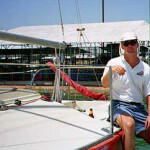 One of the Nations leading instructors, Paul Corey. 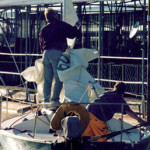 A real sailor always leaves a boat in Ship Shape and Bristol fashion! 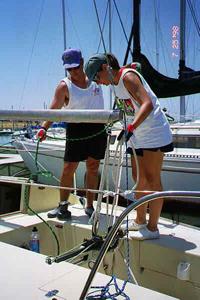 These pictures were taken during one of our Bareboat Certification courses. All of these photos were taken by our students. 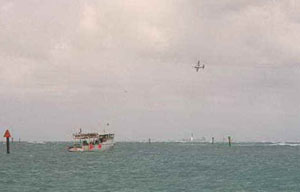 The location was the Florida Keys during March 2000. 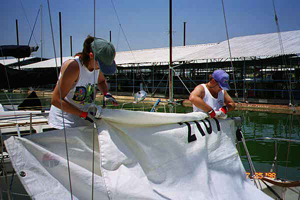 As you view these pictures remember that other Dallas area sailing schools teach their Bareboat Certification courses on local area lakes. For over half a decade we have refuse to take that shortcut. 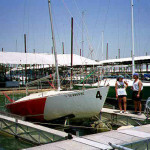 Which school do you think produces the more qualified Bareboat Skippers? 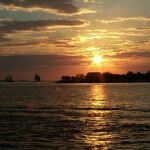 This one week course & vacation began in Key West. 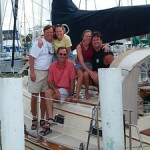 We sailed the 70 miles to the Dry Tortugas where we spend a few days in a remote tropical setting. 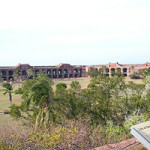 We visited Fort Jefferson which was built around the time of the civil war and is now a national park. 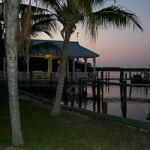 We continued on to the West coast of Florida, enjoying the peaceful anchorages along the way. Now, sit back and enjoy. …then go out and create some pictures of your own! 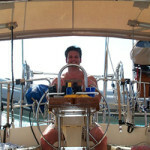 Take the helm, be a factor! These photos were taken during the first week of November, 1998. 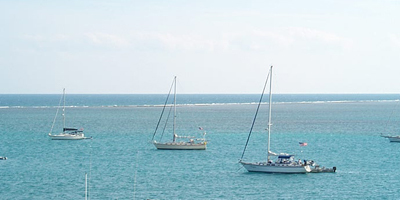 They were taken by our students aboard a 53 ft Hans Christian during one of our Bareboat courses in the vicinity of the Dry Tortugas, Florida Keys, Florida. 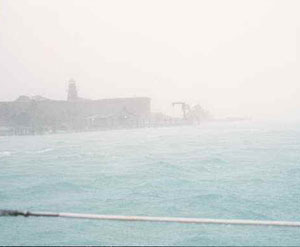 The storm is Tropical Storm MITCH (formally Hurricane MITCH). After causing the loss of many lives in the Western Caribbean and Honduras, MITCH disappeared from concern and from weather forecasts. 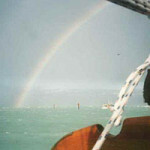 It began to emerge into the Pacific Ocean as gentle rain showers. Suddenly it turned almost 180 degrees. In just a few short hours, MITCH regenerated and accelerated from a slow moving storm to covering almost 600 miles per day. 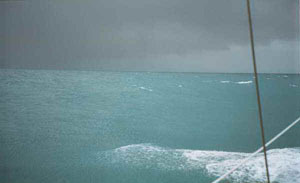 This tropical storm spawned numerous tornadoes and dangerous winds. 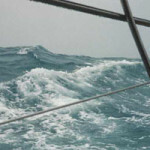 We experienced winds in excess of 70 knots (about 80mph). This story includes tragedy and we don’t take it lightly. There were many lessons learned by all involved. Nature can be very beautiful and then she can be very treacherous. This story is very similar to those told throughout the ages. 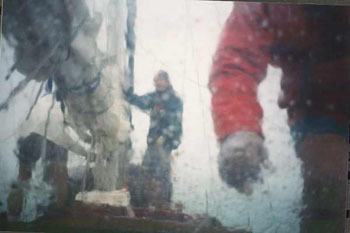 It is part of seafaring. 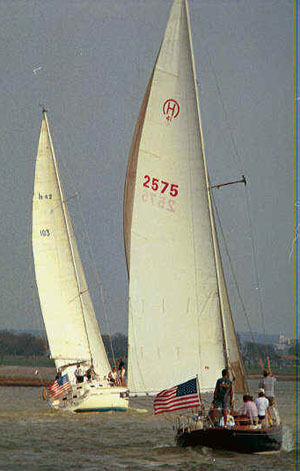 It is a very real possibility in every sailors future experiences. 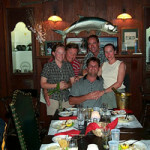 This presentation contains an ominous photo of a fishing vessel named “KARE FREE” with two crew members onboard. 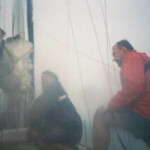 Within an hour after the photo was taken (just as darkness approached) the “KARE FREE” left the relative safety of our anchorage to provide assistance to a fellow fishing vessel in distress. The “KARE FREE” apparently ran out of fuel, was unable to maintain steerage, and capsized …there were no survivors. One body was found, the other was never located. Photos of the U.S.C.G. 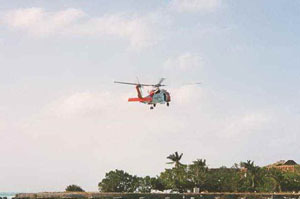 aircraft are dedicated to those onboard who conducted the Search And Rescue of the “KARE FREE” in gale force winds. The date stamps on some of the photos are incorrect, please excuse the camera error. Thanks for your interest and understanding. 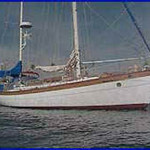 Our Vessel – 53 ft (LOA) Hans Christian Hans Christian, “KRISTA ANN” is a world-class, offshore cruiser. 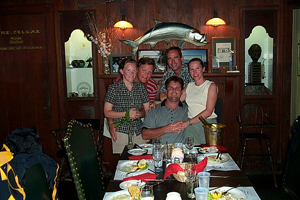 Monday, Nov 2, 1998 – At the docks in Key West, Florida. 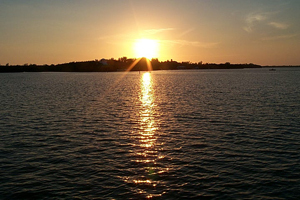 Sunset at Marquesas Key Sunset at Marquesas Key Anchored at the Marquesas, Florida Keys. This sunset offers little indication of what is to come. 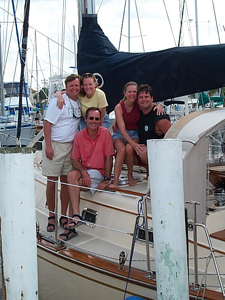 Tuesday, Nov 3, 1998 – in bright sunshine, we set sail for the Dry Tortugas. 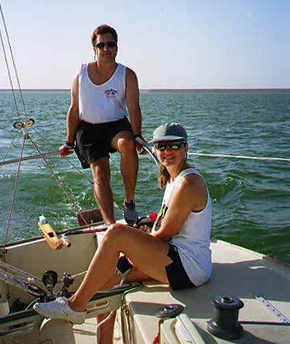 On a beautiful broad reach, we are accompanied by dolphins. 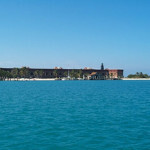 We arrive at Fort Jefferson, Dry Tortugas (pictured below), anchor, and snorkel on near by reefs. MITCH is beginning to reform near the Yucatan peninsula, just a few hundred miles away. 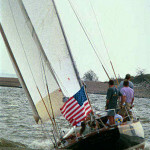 That Tuesday evening, our weather report was forecasting rain & 20-30 knot winds the next day (Wednesday, Nov 4, 1998). However, by the next morning (Wednesday, Nov 4, 1998), MITCH had regenerated into a tropical storm and had altered course directly toward our position. It’s last reported speed was 6-8 knots. We estimated we have 24-36 hours to escape. 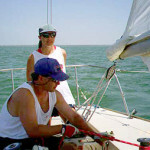 We weigh anchor and head for Key West, Florida (60-70 miles away). 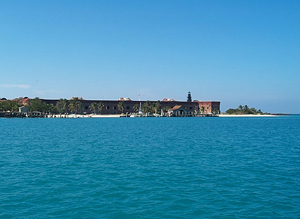 Wednesday, Nov 4, 1998 – Morning: Dry Tortugas, Florida Keys. Photo from our cockpit. We’ll attempt to flee MITCH an estimated 24-36 hours away. 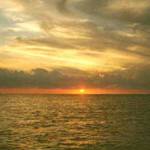 MITCH becomes entangled with a fast moving front sweeping across the Gulf of Mexico and accelerates to almost 20 knots. 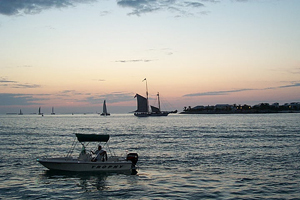 Faced with increasing winds on the nose, we realize we are being overrun and make the decision to return to the relative safety of the anchorage at the Dry Tortugas. 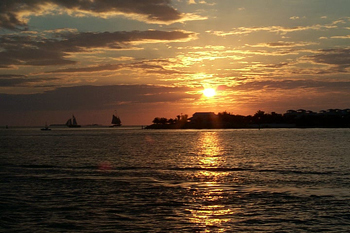 Continuing toward Key West would have put us in the “dangerous semi-circle” of the storm …at night. 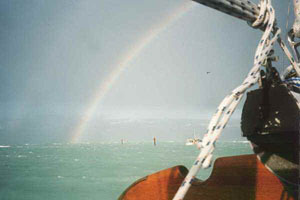 Noon: Straights of Florida (near Rebecca Shoals). 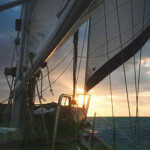 Close-hauled in winds now approaching 30-40 knots and seas 6-10 ft & building. MITCH, strengthens and accelerates. We are being overtaken. 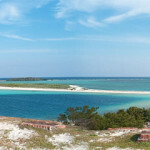 The decision is easy …return to the Dry Tortugas. 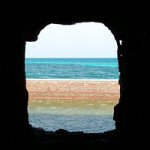 Afternoon: Returning to the Dry Tortugas. Eye of MITCH just hours away. 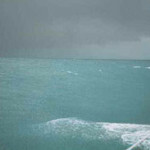 Sometimes it Rains Sometimes it Rains Near Fort Jefferson, Dry Tortugas. 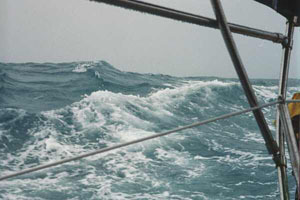 Anchoring in estimated 60+ knot winds. After our anemometer pegged out at 55 knots, the wind continued to increased appreciably. 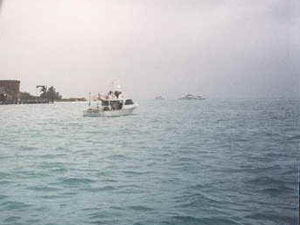 This motor vessel is dragging anchor as it disappears into the fray. It attempted to anchor a mere 100 ft from our position. 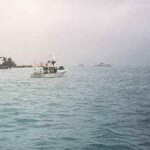 A fishing vessel to our port side also lost it’s anchor and drug out of sight. Our ground tackle held, we never budged! Later, radio transmissions indicated all was well with both vessels (as best as we could tell). 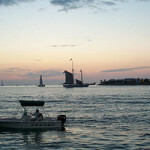 Late Afternoon: Anchored within the Dry Tortugas. 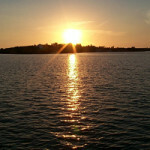 Evening: Anchored within the Dry Tortugas. An almost complete lull provides for this ominous photo. 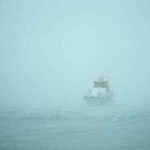 We just happen to capture a picture of the ill-fated fishing vessel “KARE FREE”. 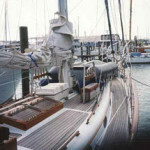 Later that night she capsized in storm force winds and seas (there were no survivors). Our vessel had two anchors set off the bow. 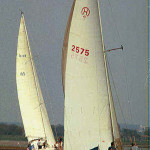 To starboard was a 54# Delta on 180ft of chain. 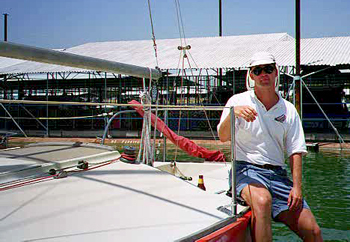 To port was a 45# CQR on 50ft chain & about 200ft of rode. Our anchors held fast, we never drug. 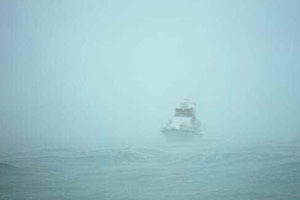 Overnight, during the brunt of the storm, a small fishing vessel did drag to within 50ft of our position. The captain refused (or was too busy, or perhaps didn’t speak English) to respond to our radio attempts but he did motor against the wind to reduce the force on his ground tackle. Throughout the night the VHF radio was alive with garbled conversations. On several occasions there were unintelligible radio transmissions including some yelling and a fair amount of cursing. 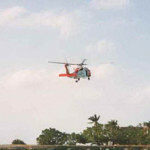 We heard no calls for help but there were several indications that all was not well. 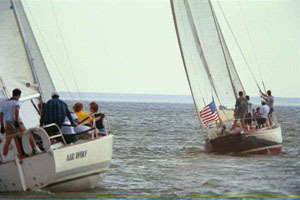 One transmission questioned “Why would someone jump off of a perfectly good boat?”. Another exclaimed: “They came all the way from Fort Meyers without enough fuel”. As the eye passed over us, we observed a bright full moon and winds less than 20 knots. Winds then switched out of the NW and the storm resumed. 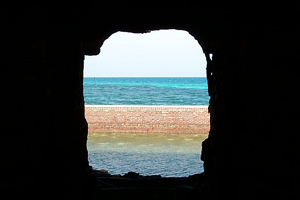 Now in the lee of Fort Jefferson, the worst is over …for us. 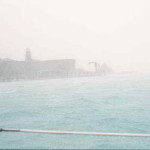 Thursday, Nov 5, 1998 – Early Morning: In the early morning hours (between midnight and 1am) on Thursday, November 5, 1998 the center of MITCH passed over our position. 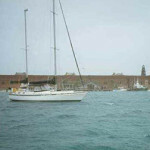 Wind speeds were clocked at 71 knots (reported by Fort Jefferson, Dry Tortugas, Florida Keys). We awaken to the sound of a low flying C130 Search & Rescue aircraft flying a search pattern, looking for the “KARE FREE”. Late Morning: As the sun begins to break through, a surreal double rainbow (look closely!). In full sunlight, the tortured water, filled with white sand, is almost blinding. Searching for “Kare Free”… The “KARE FREE” was discovered in 60 ft of water. 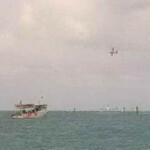 The US Coast Guard deploys several helicopters (assumed to be based out of Key West) with divers to investigate. Wind speeds were still 30+ knots. 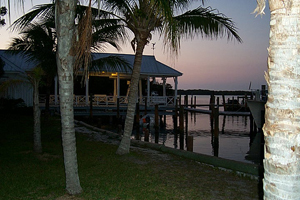 Note the wind-blown branches of the palm trees, they don’t grow pointing upward. Also notice (photo on right) there are two helicopters, one already on the make-shift landing pad, the other just landing. 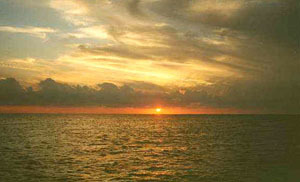 Friday, Nov 6, 1998 – Sunrise: Underway, returning to Key West Broad-reaching in 25-30 knot winds. 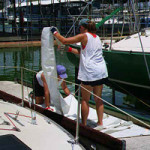 “KRISTA ANN” is making hull speed. 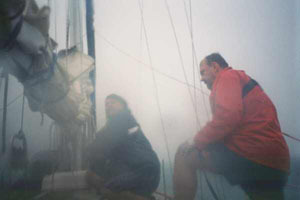 A personal word from the Captain – This makes the 4th named-storm I’ve had the “honor” of experiencing. While I have no interest in adding a 5th to my list, prior experiences had an appreciably effect on confidence. Simply knowing what will be in store provides a comfort level and allows one to think with a clear mind. While I was never in immediate fear for our lives, I held great respect for what was happening. We prepared the boat for what was about to happen. 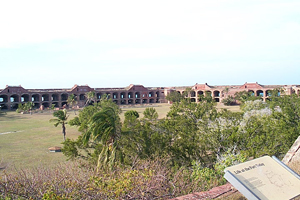 Finally we established an abandonment plan to Fort Jefferson, should the need arise (i.e. ground tackle failure). 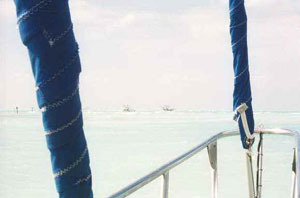 We were onboard a world-class offshore boat and we were well trained. We knew how to sail. In the end, this is what provided the ultimate defense. We were equipped with a Weather Fax and received broadcasts twice daily. It wasn’t until the morning of Wed, Nov 4 that MITCH fully regenerated and began to accelerate toward our position. The prior evening’s Weather Fax indicated that we should expect some rain from the outer remnants of MITCH (then forecasted to move due north, hundreds of miles to the west of our position). Apparently, our location was so close to MITCH’s area of regeneration that accurate forecasting was next to impossible. 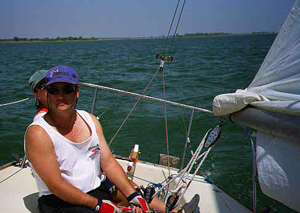 Even 4 hours prior to reaching our position, MITCH’s wind speeds were forecasted to be only 30-40 knots. 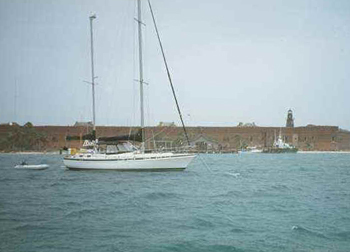 Fort Jefferson (Dry Tortugas) recorded wind speeds in excess of 70 knots. We were not the only ones surprised by MITCH. 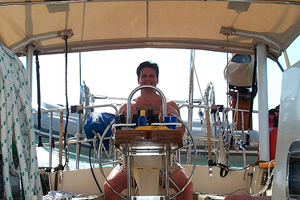 The annual “Caribbean 1500” became entangled with MITCH in the North Atlantic the next day. By that time MITCH had lost it’s tropical characteristics and had become extra-tropical, loosing it’s defined eye. However, MITCH was still a formidable storm, at least one dismasting occurred. Fortunately, that fleet had a 24 hour warning. Always prepare for the worst if there is any disturbance at a latitude below your own position in areas susceptible to tropical storm formation. Today’s popular blind dependency on modern technology is a philosophy filled with peril. Use technology but learn to think. 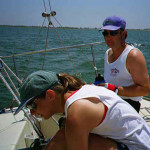 Enjoy the sailors life but learn to SAIL! 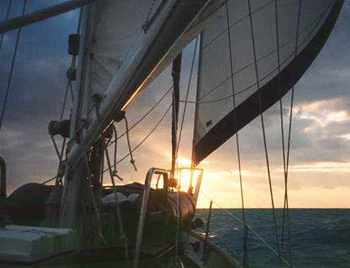 A sailor does not venture to sea on their own terms, they do so on Mother Natures terms.